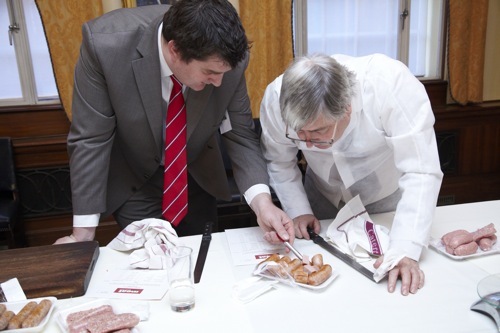 The Great Hampshire Sausage & Pie Competition returned after a two-year break, with 170 entries across 12 categories. Impressed by the range of flavours and quality, expert judges handed out 67 gold awards, 52 silver awards and 27 bronze awards. The competition took place in Winchester on Tuesday (9 April) with a broad range of flavours. Among the winners were Greenfield Pork Products, Smedleys Butchers, LJ Smith Butchers and Tatchbury Manor Farm. 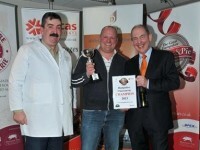 Martin Martindale of Greenfield Pork Products claimed the Supreme Sausage Champion 2013 with his entries in the traditional and speciality pork sausage categories. Martindale was “delighted” to have won the award and claimed the competition was very important for his business. “I’m also pleased for my son, Tom, for winning the speciality pork sausage category for his chilli and garlic sausage,” he added. Bpex, Dalziel and Lucas Ingredients were the sponsors for this year’s event.